Many people when they first start out in steampunk want to attend steampunk events, but aren’t sure what is appropriate to wear. First of all, don’t worry too much about it. Steampunkers will understand that you are beginning and they love to help people get started. Most costumes take many months to create or find and customize, so there is no expectation placed on beginners to dress up in any sort of way. Just attend the event in your regular clothes if necessary. If you want to get started dressing up, pick clothing that looks like it’s from the 1880’s or so. Victorian English clothing tends to be the basis of most costumes. It is not the only style, there are many people who dress up in Victorian clothing from other areas, including the American west, pirates, and there are even people who do a Mad Max style meets Victorian. For the beginning though, let’s keep it simple and your style can develop as you experience more steampunk and figure out your steampunk character. Men have it easy. They can show up in a white dress shirt, black dress pants, and dress shoes and they look great. Add to that a classy vest and a top hat or bowler hat to really be looking good. Even more stylish gents may want to add an old-fashioned frock coat over top. Click here to see some example pieces of men’s steampunk clothing. Women usually can’t pull their steampunk costumes out of their closets, so need to pick up a few things. For beginners, it’s easy enough to pick up a long, flowing skirt and top it with a button-down dress shirt. For many, steampunk is an excuse to wear a flattering corset overtop their clothes, and of course a great hat. Go for a hat that looks old-fashioned, something with a broad brim, or a bonnet, or even a mini top hat. You can pin up your skirt so that it’s higher in front or exposes a thigh, you can wear tights, and there all sorts of stunning steampunk shoes you can wear that will set off the outfit. Click here to see an entire steampunk outfit that’s easy to get and wear. To many people, steampunk means goggles and gears, so they add them to every outfit. This isn’t a requirement by any means though, and some people only like to add goggles and gears when it makes sense to do so. Use your own discretion. Most of all, have fun with your costume! Steampunk is all about having fun and there are no strict clothing rules. Wear what you want and enjoy the experience! Steampunk is the juxtaposition of old-fashioned, primarily Victorian fashion and style that has been twisted. Steam symbolizes the era of steam power, and what would have happened if steam had continued as the way to power the world. Steampunk laptops, anyone? The punk aspect is the free-wheelin’, anything goes aspect that distinguishes steampunk from other recreation groups. Steampunk has formed into a subculture with steampunkers developing entire characters and costumes. 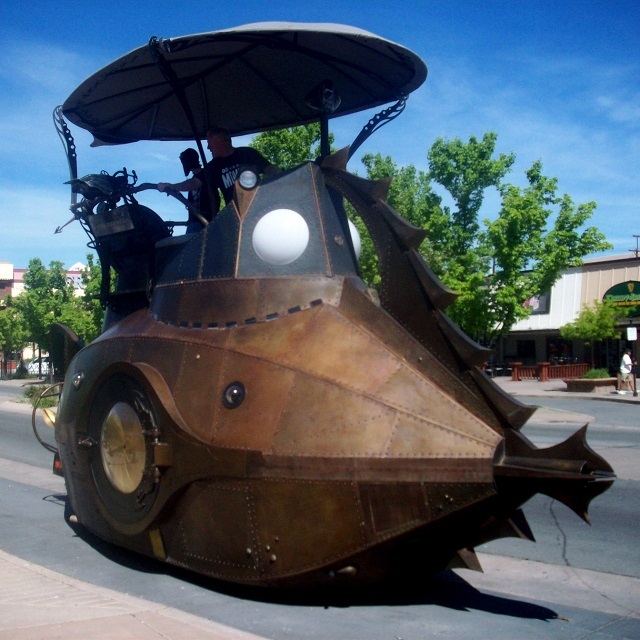 There are books and movies and even steampunk vehicles. All share some traits in common; they are fantastic voyages into potential timelines. Whether the costume or story is set in the late 1800’s or in an apocalyptic future, they all represent what could be happening in parallel dimensions. So if you like to dress up in imaginative fashions and help create a fantastic world, follow my posts on steampunk as I share this fun and creative style.